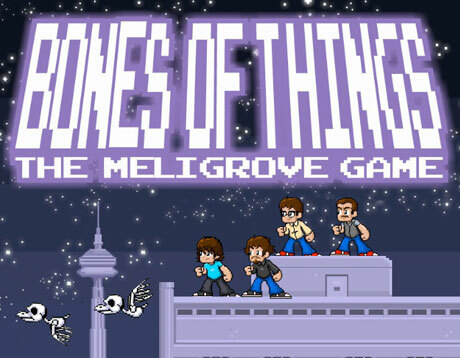 We're living in something of a golden era of indie rock-themed videogames, and now Toronto's Meligrove Band have become the latest group to get their very own game. It's called Bones of Things, which is the same name as the outfit's recent album, and it was designed by Egg Roll Digital Studios. The game is free, and it allows users to play as either Jason Nunes (vocals, guitar, keys), Darcy Rego (vocals, drums), Brian O'Reilly (guitar, synth) or Michael Small (bass). This is a 16-bit adventure in which players aim to outlive their bandmates to collect Gold, Platinum and Diamond records. Collect maple leaves and they can be traded in for classic videogame costumes, turning the characters into Mega Mike, Darcy Kong, Jay the Elf and Super Mario Bri. It's available for either Apple or Android devices. Below, listen to an 8-bit version of the Bones of Things song "Ichi Ni" as it appears in the game. This retro chiptune reworking was recreated by Nunes. Meligrove Band will perform at the Drake in Toronto on December 27 for the What's In the Box festival.